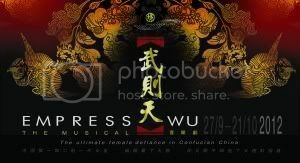 Empress Wu is an original musical based on the life, loves and times of China’s first and only female emperor, who had ruled the country with an iron fist more than a thousand years ago. … It was China’s golden age and the Empress held together a sprawling empire against external threats and internal court intrigues. Not unlike the other emperors, Empress Wu’s ascent to power was littered with acts of betrayal and treachery but also of honor and loyalty. A controversial figure condemned and praised by historians in equal measures, the Empress enjoyed supreme power. She was ambitious and ruthless. A visionary. An autocrat. And ultimately, the symbol of female defiance in Confucian China. I shocked my family by saying that I think Paper Crane was better than Empress Wu. Let me explain why I think so. First and foremost, Empress Wu is supposed to be a musical. It does integrate songs and dances but I thought that the music was terribly underutilised. Looking at the programme, in the 12 scenes of Act One there are 7 songs listed. I frankly only remember the existence of three – the very brief piece they used over and over and over again during scene changes, a love song between Emperor Gaozong and Lady Wu, and the “Twelve Suggestions” song. I have to look at the programme and think really hard to remember what the others were. Act Two was a little better, with 9 songs in 11 scenes, but offhand I cannot remember more than four. The music itself was actually quite nice, but the songs were mostly too brief and not vital to the story. The longest songs were the slow love songs, which were rendered boring by the length and by the fact that I’m unable to appreciate the Mandarin lyrics (even though there were surtitles). I had trouble liking the way the story was presented. At three staggering hours, this was far too long. I understand that they wanted to show how this young girl went from concubine to empress. That’s well and good, but the story is so complex that it’s nearly impossible to do it well without condensing it significantly and taking artistic liberties the way Peter Jackson did with Tolkien’s Lord of the Rings. Furthermore, so much of the story was delivered through dialogue and narration – almost 80%, I would say – that the music really took a back seat. Perhaps that’s why I find it so difficult to recall the musical sequences. Empress Wu relied very heavily on the narration by the two eunuchs (played by Sean Toh and Paul Wong, who were easily the best characters in the show), which was both good and bad. Good because they did well and managed to present a lot of the explanations quickly; bad because there was far too much of it – take it away and the story would barely hang together. The direction bothered me as well when it came to Lady/Empress Wu, Empress Wang, and Emperor Gaozong. They seemed to frequently revert to the same poses for no real reason. The women were especially given to holding their arms out to their sides, and letting the sleeves fall – as if just trying to display the length of the sleeve or something. I could not understand it. It looked unnatural and almost silly at times. Maybe they were attempting to emulate some traditional Chinese operatic acting styles. But if they were, I don’t think it was a particularly good choice. I’m inclined to blame direction here rather than the acting because the director has the responsibility of directing the actors and thus the actors are subject to the director’s decisions. Credit where credit is due, though – for a production of this level (semi-pro? Halfway between amateur and pro), the technical aspects were quite good. Costume design was fairly good, set and lighting design were decent. The singing was good too. There were few dance sequences but the choreography was pleasant and the dancers did well. I had problems with the odd actions, but overall the cast were all right – no one struck me as horrible or stiff. The most entertaining were the two eunuchs, of course, as they had the funniest lines; they also had pretty good diction, and used an appropriate “storyteller” manner, which fit the whole play. Empress Wu was a good effort, but the flaws really undermined it for me. I admit to dozing off for a while in the last scene – and considering that I never fell asleep even in The Hobbit, which was er… odd and just “meh”, or in Mamma Mia, which I thought rather boring, or Malaysian Girls, which was just “okay”… that says quite a bit. :/ In contrast, Paper Crane, though a little less polished with slightly weaker vocals, had better direction, a stronger narrative, better characterisation, used the music far better, and was distinctly shorter than Empress Wu. That is why I favour Paper Crane over Empress Wu. * For instance, they completely wasted the scene where Lady Wu’s baby girl dies. All they showed was Lady Wu walking into her room with Emperor Gaozong, only to have the two maidservants prostrate themselves on the floor and start crying loudly, pleading their innocence and begging forgiveness as the princess is dead. Lady Wu checks the child and proceeds to cry and wail as well whilst the Emperor paces the room, distraught, and questions the maids. Through the dialogue, you learn that it seems Empress Wang was the one last with the baby and so she must be the murderer. The narration that follows the scene informs us that it was Lady Wu who killed her own child. I think that should’ve been shown. What would have been so difficult about something like this instead: Empress Wang walks in and looks at the baby for some reason (a formal visit?). Maybe she plays with the child a while, then leaves. Lady Wu comes in right after she does, and it’s made clear from her body language that she’s been watching. Lady Wu goes up to her child, looks at it coolly… and kills the baby (strangulation? suffocation? Probably suffocation would be less horrific to watch, even if it’s just a doll there). Lady Wu leaves. Two maids enter, chatting about Empress Wang, who was so polite to them as she left. They check on the baby princess and find that she is dead. Cue screaming and howling. End scene. Perhaps I shouldn’t be criticising it in such detail, but I think that whilst the original scene fulfilled the basic purpose of moving the story along, it showed Lady Wu as a victim and did not show Empress Wang’s innocence. Showing Lady Wu’s horrible action would have done the reverse: demonstrated that Lady Wu was scheming and cold, and that Empress Wang is innocent and not cruel – that is what was needed. I didn’t understand why something as dramatic as that was staged so blandly (though I suppose one can’t exactly call the maidservants’ crying “bland”…), totally overlooking the potential in it for showing the personalities more distinctly.